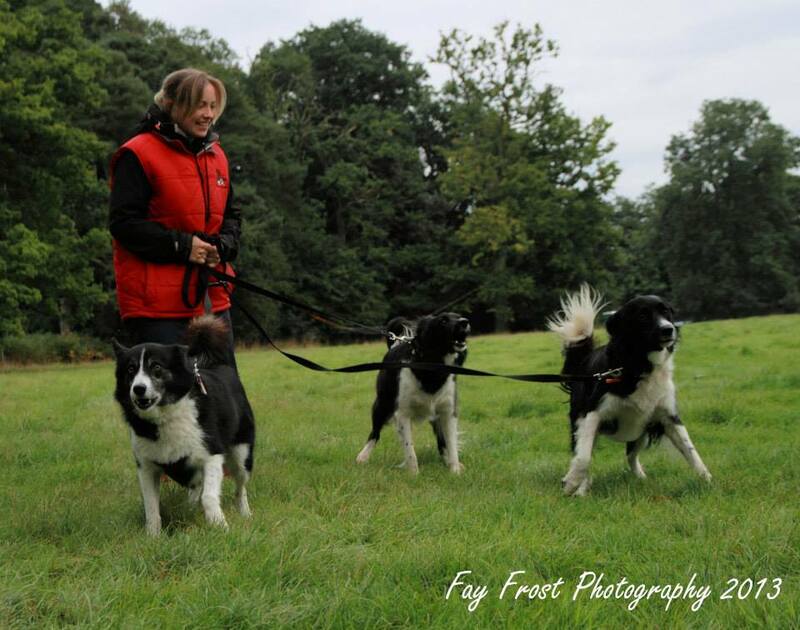 The Box End Collie Wobbler took place on Saturday 26th October at Box End Park, near Bedford. We arrived mid-afternoon on the Friday to set up and check out the course on foot before we raced it on the bike, as usual. The first thing that struck me was how lovely the venue was, there is a lake in the middle of the park where many different types of water sports were taking place and then large areas of grass around the lake provided the course for the race and the on-site camping. On meeting the organiser and being directed around the permanently set out 5km course, marked with clearly signposted blue directional arrows, we took the opportunity for a jog around in the light. 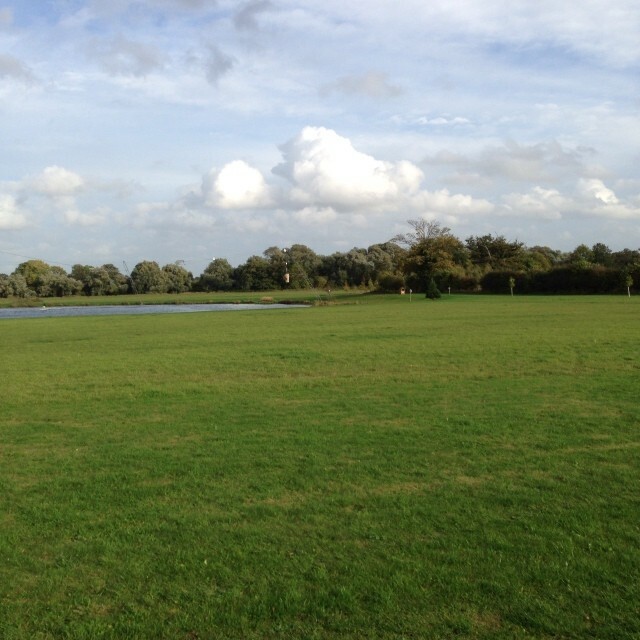 The venue is frequently used for other events and so I was surprised to find the course was in very good condition, with hardly any mud and certainly easier conditions than what we are used to contending with. That having been said, the 100% grass trails are not an easy option, as I discovered recently in Scotland, and so I knew it would be a tough ride on the bike. The course started down the side of a hedge with the lake on your left and you peeled off right around a big open area, then around left to run alongside a river on the right and the lake back on your left across the field. A long straight along this track took most of the sting out of a fresh dog or dogs before you turned around the top of the lake and up a slight incline, which took you into the more technical section of the course. The twists and turns in this part were perfect for holding the dogs’ attention and the tracks narrowed too at this point with small trees on either side. One short, steep hill took you to the top of the plateau and from there you continued to travel through winding paths until you emerged towards the top of the lake again and a sharp left hand turn brought you back down to where this section started. To get back to the finish however, you ran alongside the lake itself and with quite a strong headwind, this was probably the toughest bit of the race. We completed the course on Saturday morning in an acceptable time and took 3rd place in the Womens’ Bikejor Class but I was yet again reminded of how much fitter I need to be to really get myself up the placings. Donnie did a great job but the lack of ‘on grass’ fitness caught us both out on the last section of the race and we both struggled to achieve more than an amble into the finish. The canicrossers had an option of doing a second loop of this course and many did take this 10km option, passing over the timing mats to get accurate times for both laps through the chip timing system which was used at this event. Overall, considering this was a brand new dog sport event, I think it went very well and with a few tweaks to the organisation of start times and marshalls, I think this will become a very popular race venue for future events through Galeforce events (http://www.galeforce-events.com/) who did a great job of their first dog sport race. The Wyedean Quest Lite took place over the weekend of the 19th & 20th October at the Beechenhurst Picnic Site in the centre of the Forest of Dean. The venue itself is well known to us at K9 Trail Time, as it has been used for previous Wyedean Mushing events and is quite local for us. We arrived early on the Saturday morning to set up the stand and get ready for the days’ racing but it felt warm and humidity levels were a little bit higher than normal for this time of year. This was confirmed at the race briefing and it was decided that only the bikejorers, one dog scooterers and canicrossers would be allowed out to race in the morning as the forecast was to get cooler as the day went on. The trail itself was nearly 3 miles long and was entirely on wide, hard packed forest tracks. The start chute took you up a relatively steep hill to start and past the ‘Giant’s Chair’, a local landmark which you can’t fail to spot on the way past. The trail then straightened out and continued for about half a mile before a left turn, followed by a right turn took you further into the forest. A fairly sharp left hand turn guided you back downhill towards the picnic site and with another couple of turns you were nearly back at the finish, with a sweeping right bringing you into the finish chute. Marc went out with Donnie during the morning on the bike and had a good run, except for a little bit of paddling which slowed them up in the middle of the course! I took Tegan and Judo on the scooter later in the day when the teams were allowed out. We completed day 1 heading out in twilight and by the time we finished, it was dark and the scooter lamp and headtorch I had fixed to us, were needed to see the trails. I’d like to say I was pleased with our performance as we had borrowed a Traczer Bikes Arrow Scooter to give it a whirl, but even with the lightweight scooter we were still slower than I would have liked. Tegan didn’t seem to like the speed or the surface of the trails and dug her heels in a bit when we should have been flying down the long straights. After spending the night camped out in the forest with the other competitors and being woken by the glorious sound of the sled dog teams ‘woo woo’ing the dawn in, we were ready for an earlier start and a shortened course to allow for the mild temperatures. Marc and Donnie had a much better run and came in not long after the leaders in the bikejor class, making up a place and taking the third place for the male bikejor class. Tegan, Judo and I also had a better run over the shorter course and although we didn’t quite do enough to move up a place, we weren’t far off and retained 6th place for the 2 dog open scooter/rig class. Overall the event was very well organised and the timing system was faultless, there was also a trial of microchip checking, which is set to be the norm in International events in the future. We really enjoyed the flexibility of the timing to allow us to go out in the evening when it was cooler for the dogs and the relaxed atmosphere which meant no-one was really concerned about anything except the dogs’ welfare. 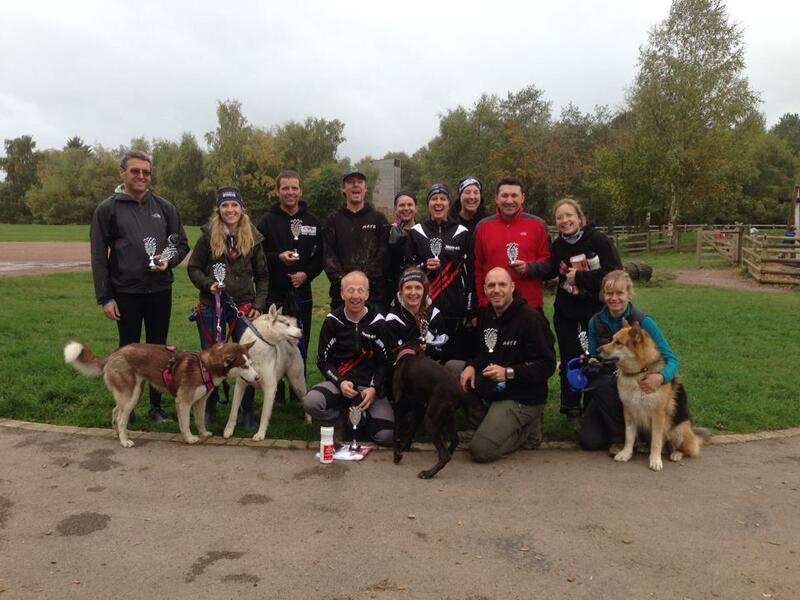 I’d recommend this event for anyone starting out in racing, particularly those who run larger teams of dogs, as it is predominantly a sled dog team event with the benefit to us of having open bikejor, scooter and canicross classes too. The CanineMax 2013 CaniX Championships were held over the weekend of the 12th & 13th of October at the fantastic venue of Pembrey Country Park, Carmarthenshire, which is one of my favourite places in the whole of the UK to run dogs. The Park itself has had a bit of a re-vamp recently and now boasts a licensed cafe and showers to add to the miles and miles of woodland, fields and beach available to use. We arrived early afternoon on the Friday to set up and run the course, as it had changed slightly from the route we ran back in March/April over the Easter Bank Holiday weekend. As always the trails, which are a mixture of grass, hard packed sandy paths and the odd section of forest track, were a pleasure to run on and if anything were in better condition than they had been earlier in the year. This made for a fast and fun 3 miles and I couldn’t wait to tackle in on the bike with Donnie the next day. Saturday got off to a good start and in spite of the temperatures initially being a little warmer than predicted, the wind picked up a bit and cooled everyone down before the racing started. The start chute was a section of grassy field that leads to a bottle neck at the end and into a single track through the woods. This rides really quick on a bike or scooter and the marshalls did a great job of making sure we crossed a couple of paths without incident. The big sandy hill which was incorporated into the course for 2013, actually rode better than I remember and we flew down it after climbing the steep uphill, which I managed to negotiate more successfully than before too. The rolling dunes that followed on from this, linked by a small section of stony forest track, had been compacted over the summer and Donnie and I made our way over them with no mishaps. The last mile of the course took us by the little lake we always stop off at on our walks and Donnie insisted we make our usual stop off for him to take a dip. I could stop him doing it but I’m soft and he tends to pick up the pace after and put even more effort in the last section if he has his little cool off! We stormed down the home straight, overtaking a fellow competitor and then Donnie decided he’d done his job and backed off a bit over the finish line, which resulted in a tangle and an entertaining finish to the race. After day 1 we were 40 odd seconds behind third and minutes behind second and first, so I knew we only had a hope at third and I wasn’t holding out much hope of that as we’d not had any issues, we were just a bit slower. 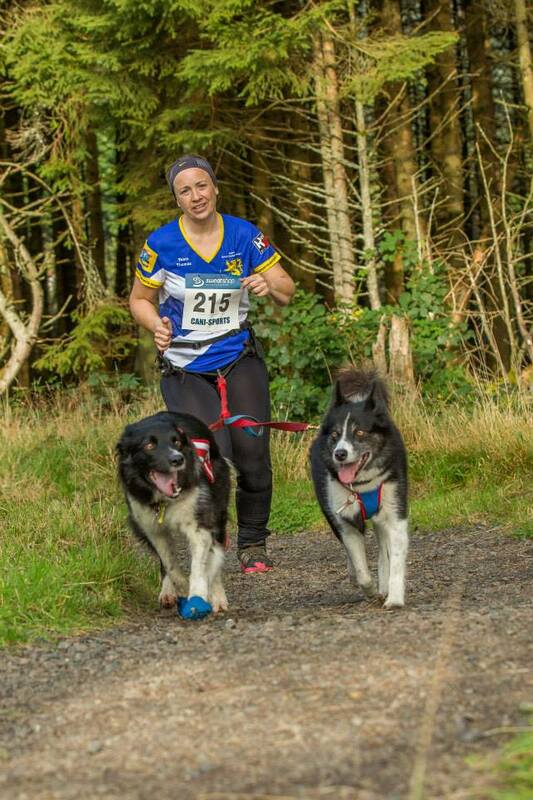 Saturday afternoon I ran the other two dogs around the course at a leisurely pace to get them out and half wished I’d done the canicross class too because the course was just so lovely to run! After a night of celebrations for my birthday, I got up Sunday knowing we had to pick up the pace if we were going to have any chance at a medal and I deliberately left my Garmin in the van so I didn’t feel tempted to check it. We had a good start and an even better run, I felt we zipped through the dunes section and was confident we had knocked off some time from Saturday. I didn’t believe we had done enough though and so was thrilled when my name was called in for the bronze medal at the prize giving! We actually beat forth place by just 6 seconds but it was enough to get us a podium finish and mainly down to the instinctive ability of Donnie to see the best lines for us to take. There was a great atmosphere of good sportsmanship over the entire weekend, with competitors forfeiting places to help others out in the race and a general sense of what I would call ‘healthy’ competition. It was a well organised, friendly event, at one of my favourite venues and I was very proud to have been part of the large Scottish Team who attended. 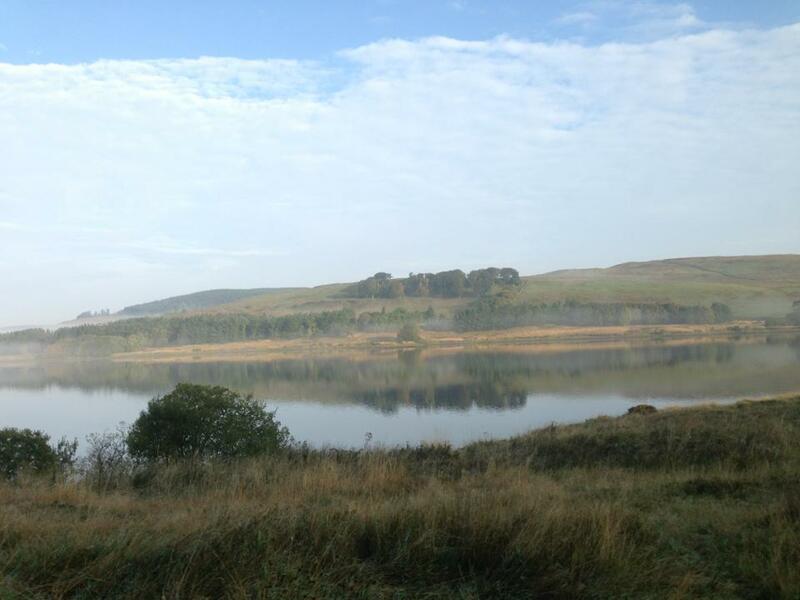 The Cani-Sports Scotland Duncarron races were held over the weekend of the 28th & 29th of September in the very picturesque Duncarron Valley near Denny, Stirlingshire. 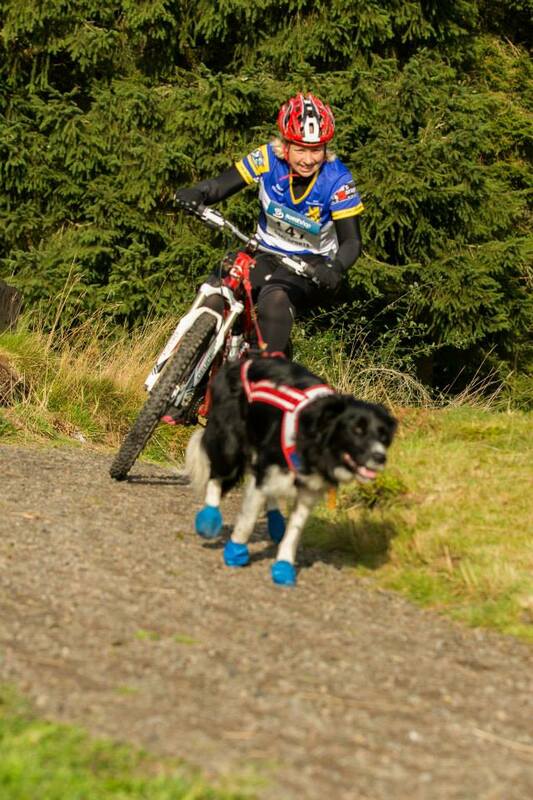 It was the second weekend of Scottish races for Team Thomas and we were looking forward to attempting the trails we hadn’t managed to see due to the snow in March of this year. We arrived in the afternoon and set up the van and trade stand ready for the weekend then took ourselves off on a walk around the lower part of the course. The one thing that always strikes me about Scotland is how few people seem to use the fantastic trails and woodlands available, it might be because I’m always on holiday when I visit, but yet again I didn’t see a soul who wasn’t involved in the race set up on my wanderings. Saturday started out misty and slightly gloomy, or as the Scots would put it ‘dreich’. However, it was clear that the weather was going to break and it didn’t take long before the mist had lifted and the sun was shining down quite strongly. I got out on the bike to check out the course before the other competitors arrived and was rewarded with some beautiful views of the loch. When it came to race time Donnie and I set out on the bike at a great pace (I’d booted him up to protect his paws as the trails were mainly flinty, hard packed trails) and we kept it up around the whole course. The start chute took us up through the medieval village, then a right hand turn down onto a path which wound it’s way alongside the loch for the best part of the course. At the end of the loch-side path we turned left up alongside a field of re-planted Christmas trees (to give them their technical name!) and all the cobwebs woven on them were lit up in the morning sun. Then with another left hand turn we made our way back down a wider forest track (at great speed) before climbing back up the hill into the woodland. The uphill section can’t have been more than about half a mile but was quite hard for me and Donnie did his best to get us up in good time. The forest track then split right up the hill again for the canicrossers (which was then followed by a long and testing downhill section to the finish) and left downhill again for the bikes and scooters, which took us back through the medieval village and into the start again where this time we were finishing. Donnie and I made good time and before I knew it, it was time to get out again on the short course with Tegan and Judo for the run. The short course followed the main course but with an earlier left turn away from the loch-side path and earlier into the uphill forest trail where we picked up the same course as the bikes. I was pleased to be able to stretch out a bit for the first time in nearly three weeks since my injury and we managed an ok time for the 2.5km course. 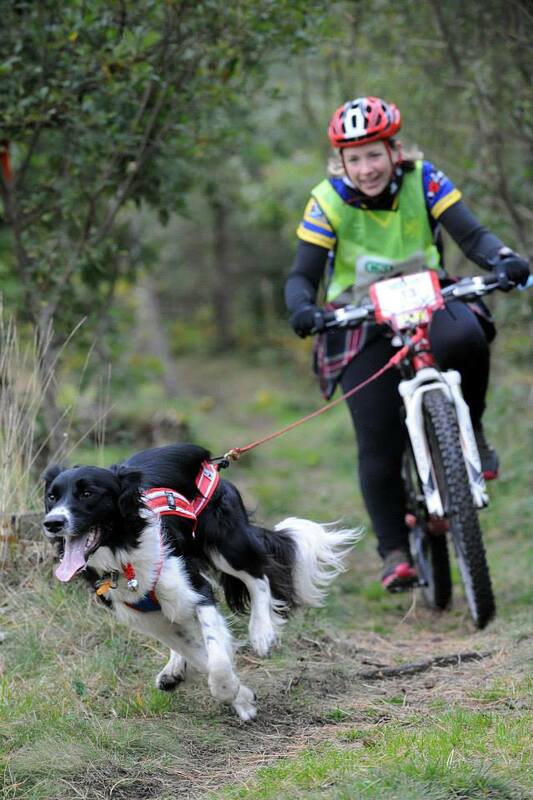 In fact we’d managed to win both the bikejor and the short course run so I was overjoyed! Sunday was even better on the bike, with Donnie and I having a great section of racing with another competitor where Donnie clearly did not want to be overtaken and put in so much speed and effort, we managed to knock at least a minute of our Saturday time. In spite of this we only took 3rd place due to some stiffer competition but I was thrilled with our progress over the weekend. Unfortunately the same can’t be said for my running and I think fatigue set in, not only from the racing, but also from the fireside drinking with some very colourful characters on the Saturday evening! All in all, I had a fantastic weekend racing and the Duncarron races were well worth staying up in Scotland for. I was glad I had made the effort to enter again after the aborted trip in March and I look forward to competing at this venue again, sometime in the future. After a long trip up from Gloucestershire (split in two by a stop off at West Morland Services) we arrived at the venue near Blairgowrie and were immediately in awe of the surroundings. The whole event was set in the grounds of the home of John and Mary Carter, who have landscaped their property to incorporate miles and miles of grassy trails, purpose made for running dogs on. There is large barn on the main drive and a couple of pens where you can drive your van in and shut the gates to enclose your van and dogs, which allows you to get straight out on the trails with a scooter, bike, rig or on foot. With the K9 Trail Time van set up on the side of the drive, I set out with a team of people to help mark the course for the race in the back of a 4 x 4, with what felt like hundreds of wooden markers. In all honesty I did little more than sit in the back and enjoy the fantastic views, but I did get a sneak peak of what was to come and settled down on the Friday night looking forward to running the dogs in the first event we have ever raced on 100% grass trails. It is also the first event I could run Donnie on the bike and Tegan and Judo together on the scooter, all in the same day. Saturday got off to a good start but I hadn’t realised just how fit you need to be to manage running dogs on grass trails. 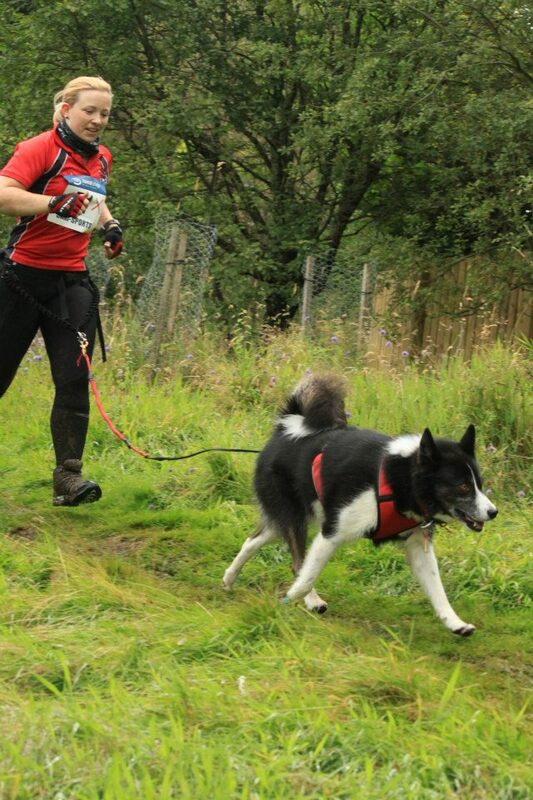 That sounds a bit odd as we’re always running on grass but not lovely soft grass like the trails at Bowlands. The course started out winding it’s way very quickly down through some fields and an orchard, then started to gradually move you uphill to the main section of woodland. I quickly learnt that I was nowhere near as fit as I needed to be and poor Donnie dog was having to work hard to get me up the hills on the bike. Once at the top of the hill, the course threaded it’s way though many of of the tree lined tracks and brought you around some quite tight and technical turns, which required concentration and control over your dog to negotiate. The very last section of the course was a gentle slope but rode fast downhill towards the finish chute and back to the main drive. After completing it on both the bike and the scooter, I was quite glad I didn’t have to go out again as I was exhausted! The canicrossers doing the 5km did the same course as us but the 10km (a little short of the 10km in reality) canicrossers had an additional section down through a field, over a ‘burn’ and up a particularly nasty, steep hill! We didn’t manage great times on either the Saturday or Sunday, even when the scooter course was shortened on the Sunday due to the unseasonal warm and sunny weather! I was a little disappointed with my attempts at speed in both classes but was still suffering quite badly with my damaged ankle and in hindsight should perhaps have just stuck to one discipline. 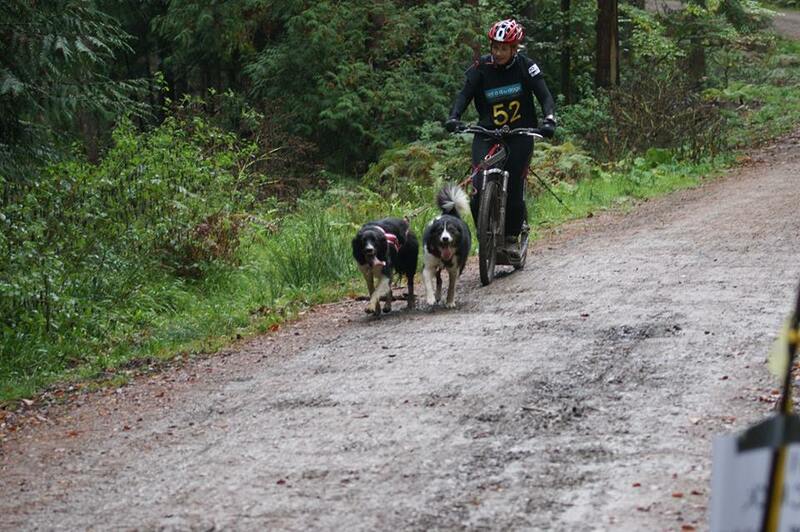 In spite of my poor performance I totally loved every minute of the Cani-Fit Experience II races, the venue could not have been more suitable and I was surprised to learn this was the first time Bowlands had been used to host the ‘mono-discipline’ dog sports (ie, canicross and bikejor, where one dog only is used). 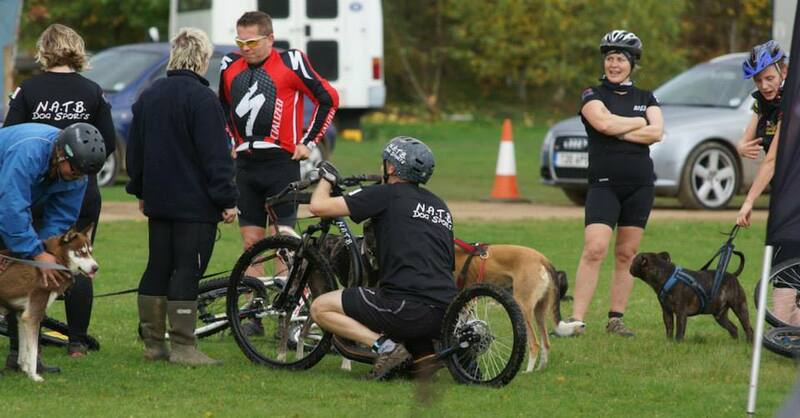 I think this weekend of racing, held in association with the BSSF (British Sleddog Sports Federation) http://www.sleddogsportsgb.com, was a fantastic advert of how the ‘Sleddog’ world can be combined with our usual canicross, bikejor and scooter races to provide a great weekends’ worth of racing for all involved. I was spellbound by the Scottish venue and although tough for the humans, the course was very kind on the dogs’ paws. 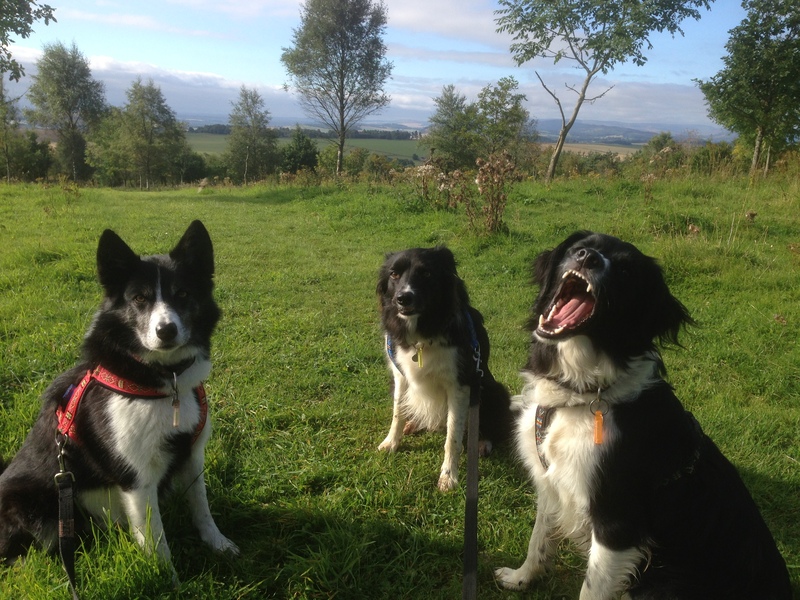 My three spent the whole time at Bowlands beside themselves at the wide open spaces, interesting smells and amazing tracks available for them to play on. In the words of a famous screen star ‘I’ll be back’! The Checkendon Challenge race weekend was held over the 14th and 15th of September at a private venue in Oxfordshire not far from Reading. 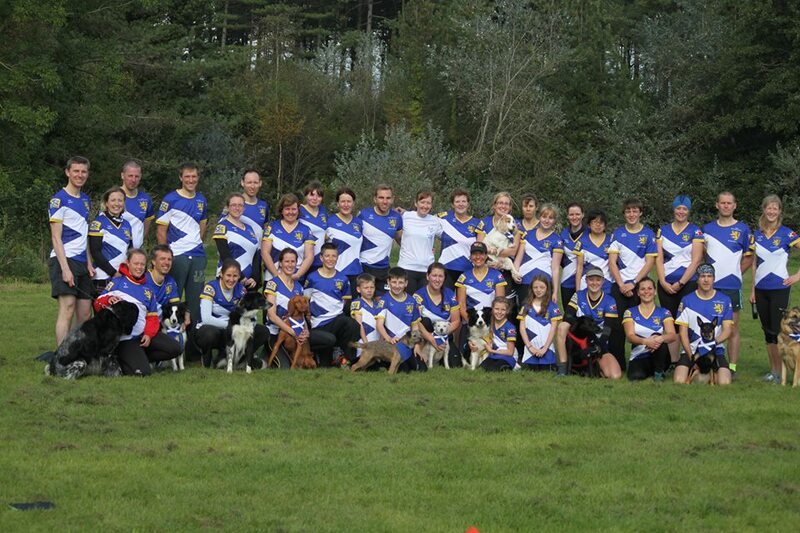 We were greatly anticipating this weekend of racing, as for many it was the first of the 2013/2014 season and was the launch of our new dogs sports team, NATB Dog Sports. We arrived mid afternoon on the Friday to set up the van and the trade stand for the weekend and were instantly impressed by the large camping field which was to be the venue for the weekends’ races. I always like to check out the course if I’m bikejoring before we actually tackle it and I usually do this on foot but due to an ankle injury I picked up in the week, there was no way I was going to be able to walk the course. So I took my calmest dog (Tegan) and off we went to see what the course was like. I have to say I was quite nervous after riding the course for the first time, the majority of it was in the cover of the woods, on a mountain bike trail which incorporated what felt like hundreds of twists and turns through some quite technical sections. I decided I had to get my bikejor boy out to have a trial run first so off I went out again and discovered it was actually easier to ride with a faster dog who pulled you through some of the more tricky sections. 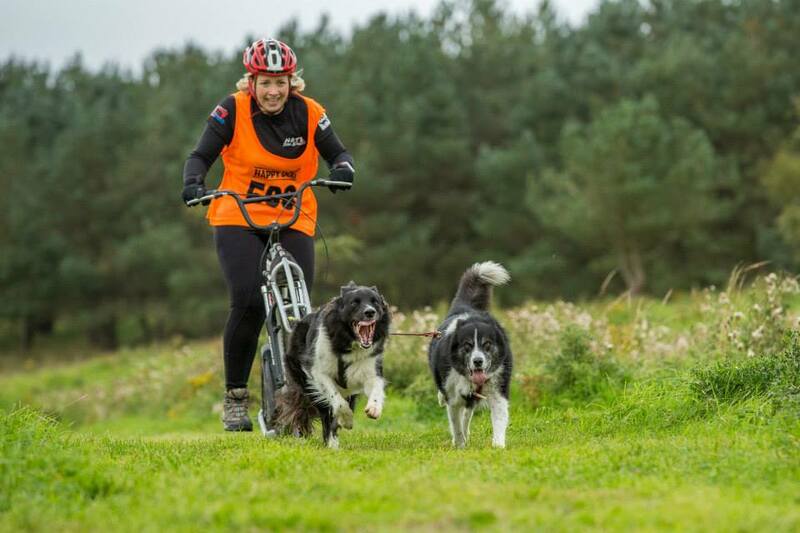 The canicrossers got an additional technical section which I didn’t see on this occasion, due to my injury and inability to be able to walk the course, but it was reported the dogs loved it and was similar to the technical sections on the bikejor course we did experience. 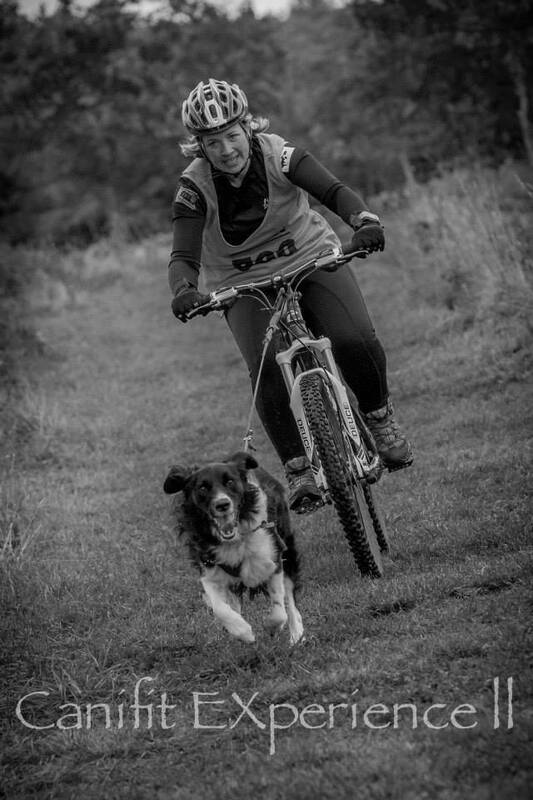 The course started out winding around the outside of the camping field on long flat grassy sections which took the ‘sting’ out of a fresh dog, before taking you under the trees and into the technical sections of the course. There were too many twists and turns to mention them all but it was fast, fun and took a fair bit of concentration to get through them all without a slip or slide (it had rained quite a lot on the Friday night). There were also some short, fast, straight sections of grassland along the edge of connecting fields which gave an opportunity to pick up some real speed. The Saturday race went well for us, Donnie seemed to read my mind about the lines I wanted to take and we had no issues with the technical sections (other than my own incompetence!). We finished the race lying third and and I was particularly pleased considering my ankle was not in a good way. After all the racing finished we had the chance to practice around the course and so I took both Tegan and Judo out on the scooter to give them a run. 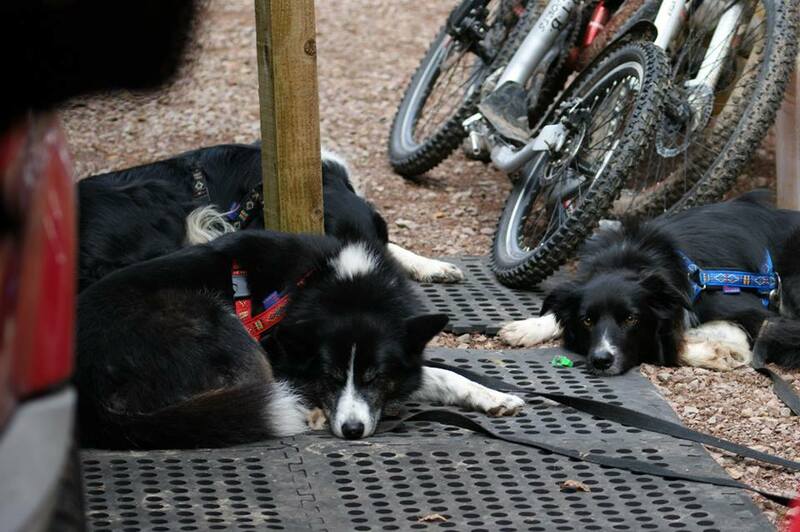 I’d like to say the more I rode the course, the better I got an judging corners and lines but I have to give all credit to my dogs who seemed to recognise where I wanted to go before I’d even decided! The Sunday race was just a good as Saturday and we retained our third place to win a fantastic bronze medal and a bag full of goodies. I was thrilled that with very little training due to the heat, Donnie and I had managed to hold off a number of competitors and take the third against some stiff competition. I thoroughly enjoyed the whole weekend at the Checkendon event and found the relaxed atmosphere including the availability of the course to train on, a refreshing change from most events. 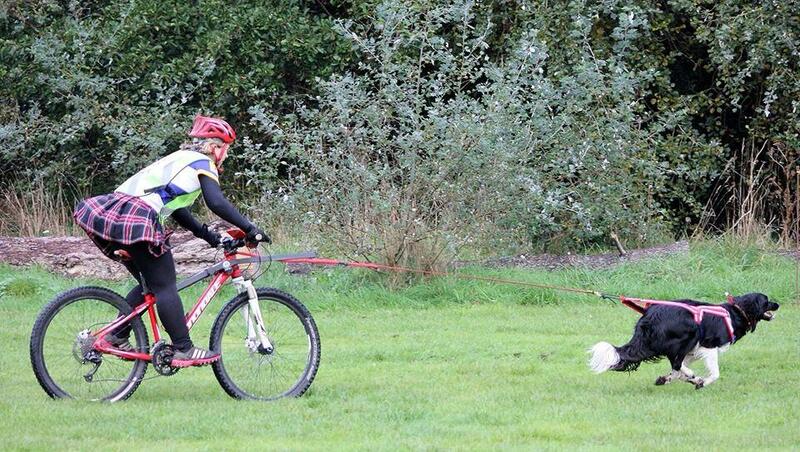 The course itself was tough enough for an experienced canicrosser, bikejorer or scooterer but with a controlled dog, easy enough to get around without mishap, as it was all flat and well marked. 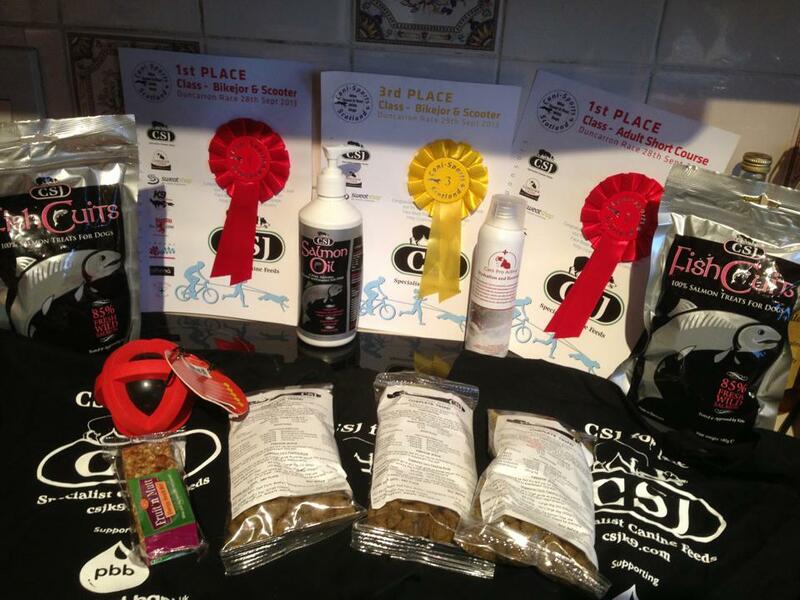 I think the first Checkendon Challenge was a huge success for all involved and with the inclusion of a few trade stands (including our own) to provide some weekend shopping for competitiors, the event was one I hope will be repeated in the future as a fixture in the canicross, bikejor, scooter race calender. 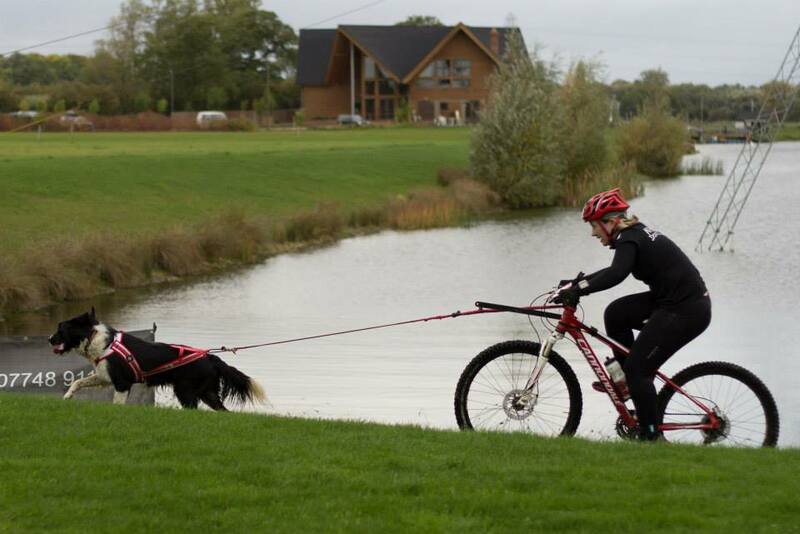 The Zero DC Short harness is one of the most popular options for canicross, bikejor and scootering because it is easy to fit on your dog with two clips on the adjustable rib straps. 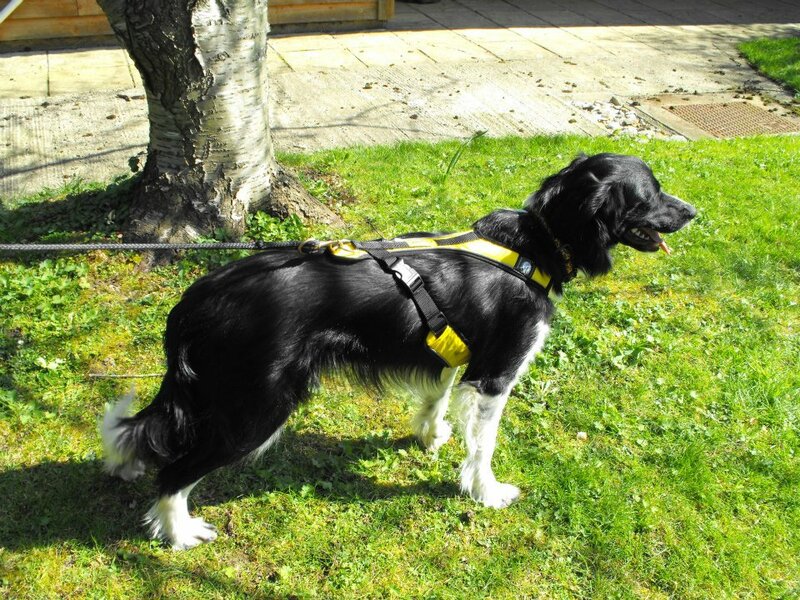 In this short blog I will point out the things to look for in fit to make sure you get your dog in the correct sized harness. 1. The Neck: The most important part to get fitted correctly on any harness, the neck should be snug around the dog’s lower neck area and not sit high enough to pull into the throat. Ideally you should be able to get about 3 fingers in the neck when the harness is pulled tight. The material of the neck should also not restrict the shoulders in any way, if the material covers the point of the shoulder at the front then it may prevent the dog from striding out in the harness. 3. The Length: The ring of the harness where the line attaches to may come to just behind the shoulder blades of your dog or extend dog along your dogs’ back to mid way down the back. The exact position of the ring will depend on your dogs’ breed and the harness will work just as well on a short backed dog as one with a longer back. The fact the ring has material padding underneath it, means the clip will not bang on the back of your dog wherever the harness comes to on the back. Fitting notes: The Zero DC Short harness is easy to put on your dog because of the two side clips on the rib straps which means there is no need to lift your dogs’ legs, however the neck may be snug to get on and off over your dogs’ head and this is perfectly normal. A common question I get asked is about tightening the rib straps as they don’t look like they can be made very tight. The straps can be tightened right down into the sleeves of the harness and by pushing the sliding adjustment pieces down into these sleeves it can be made almost as small as the neck on the harness, although to make it this tight is a little fiddly! Once you’ve got your dog in the correctly fitting Zero DC Short harness you can expect your dog to pull freely and enjoy your sports.